The Libratone Zipp is a total rework of its 2012 original. The new quirky zip-up design is fun, while the physical size - which makes it a bit too large to cart around really - lends well to stomping bass and audio output considering its £219 price point. Libratone is a Scandinavian company and does things a little differently. First, it likes its materials: whether woolly coats or similar, like with its Diva soundbar. Second, its products aren't as outlandishly expensive as most things in Copenhagen. 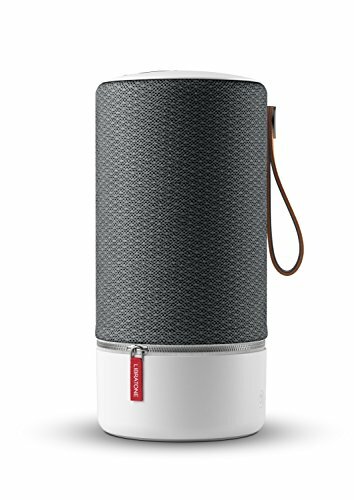 The Libratone Zipp is a typically quirky product: the second-generation model (and entirely different from the vertical-zip-up-jacket version of 2012) this is the Zipp all-new, and it's curiously larger than, well, pretty much any other portable speaker at this price point. The company might not be the best known in the UK, but even so does it have the at-home and portable Bluetooth speaker market all zipped-up with the new Zipp? We've been listening for a week to take it all in. When the Zipp boxes arrived at the office - we also had a Zipp Mini delivered to test out multi-room and multi-speaker capabilities - we were baffled as to why they were so big. "This is a portable speaker", so we thought, but perhaps not in the traditional sense. Sure, the Zipp has a hangy leather handle - much like other Danish manufacturer Bang & Olufsen also opts for in similar products - so it can be hung up, or be carted around while active thanks to its on-board battery. But the product's overall 260mm height and 125mm diameter (without the hangy handle protrusion considered) make the Zipp, well, just large. Similar £200-odd portables tend to be diminutive by comparison. Which isn't necessarily a problem, because what you're getting with the new Zipp is a lot for your money. That larger space means larger speakers and more bass than smaller constructions can manage. Plus it's cylindrical by design, so sound is projected out through 360-degrees, rather than being in a predominant single direction. As we alluded to, Libratone likes its materials and quirks, the Zipp's point of distinction being - you guessed it - a zipper. Yep, an actual zip; one used to hold the external mesh jacket around the cylinder, sat above the rubberised white base. The point of the zip? You can swap out the jackets for other colours if you're feeling a bit Ikea. Although we've tried and struggled to actually remove the red jacket of this particular review model. No biggie, though, we think it's a rather fetching colour. There are also graphite, grey and blue (Lagoon) colour options to choose from, or sold-separately colour jackets with suitably silly names: orange (Signal), green (Atlantic Deep), and deep red (Sangria). Pairing via Bluetooth is no issue at all, with the Zipp found rapidly on our Macbook Air's drop menu. The range has been decent too, even surviving being carted into a second room away from the source with the signal holding up well. Good job. But Libratone is more interested in pushing its SoundSpaces, the idea being a Wi-Fi/multi-room/synced app-based experience. Setting up is relatively simple, with everything prompted through the app - you'll just need your Wi-Fi network to connect the speakers to the same network as your source device for a solid connection. Everything can be controlled within the app too, from the volume to the speaker position (not physically, of course) to equalisation pre-set - each of which are named with practical name for "Voicing" and "Room Setting" sections. You can even click and drag two speakers together to form one space, which output together - it works really well (we tested the Zipp paired with the Zipp Mini). The Zipp itself also houses physical controls in a light-up touchpanel up top. By default there's the company's "bird" logo/symbol, but press down and you can twirl a finger around the circular panel to dip or raise the volume, or press the left/right illumination arrows to skip tracks direct from the product. Sometimes that circular "twirl" control for volume adjustment can be fussy, but we like the haptic feedback and ability to stop music by covering the logo with your hand. We've tested the Zipp using three different phones: two Android and one iPhone. The latter works a treat, with AirPlay easily handling output if music is on-device, or other services - Spotify Connect, Tidal, Deezer, Apple Music and more - or firing up internet radio stations from within the Libratone app. Switch to Google Musice on Android and it's a bit trickier to out audio, unless using a third party app via UPnP/DLNA - a limitation of Google rather than Libratone, though. Where the Libratone really excels is with the sheer oomph of its audio output. We've seen a bunch of £179 speakers, such as the Beats Pill, flip-flop their way through tracks and miss out on bass. Not so the Zipp: although it's £219, and a whole lot larger than said Pill, that reflects in the sound quality. Bass kicks hard, to the point you can feel it resonate on whichever surface the Zipp is sat (if, of course it is). But this doesn't overwhelm, with the likes of The Black Queen's Fever Daydream album vocals cutting through those poppy kicks and basslines nicely. However, we use the £900 Naim Mu-so and the Libratone Zipp couldn't nearly be compared to the clarity of such a high-end device. For it's £219, however, the Zipp is quite something, our only real criticism being that there's the lack of overall clarity; it's not the cleanest sound ever. Volume is also more than ample, with a 100W output big enough to fill a room, whether you're casually working with a little background noise or want to go opposite and hear nothing else around you. The 360-degree output does a good job of firing sound all around, although the rotation of the speaker relative to your position will give a slightly different experience - so there are still some spots sweeter than others. When the Zipp isn't wired up to the mains - and there's a UK and EU adapter in the box - its battery will give a full day's use. We've been getting a full office day at considerable volume, so think around 8-hours per charge and you won't be disappointed. You could, therefore, lob the Zipp in the car and have it as your outdoor picnic companion this summer, a task it's more than equipped for. The Libratone Zipp is a total rework of its 2012 original. The new quirky zip-up design is fun, while the physical size - which perhaps makes it a bit too large to cart around outside of the house - lends well to stomping bass and audio output considering its £219 price point. That's the rub of it really: for only about £50 more than many smaller portable competitors, the Zipp gives an extra wallop of sound. If you're after an at-home portable speaker then Libratone, whether you know the name or not, seems to have that corner of the market neatly zipped-up here.